On a side note, shattering for Alex Johnson. You’d think a story of perseverance like that would deserve a happy ending, but it seems the movies have been lying to me. That’s just cruel. Great to see the young boy from Sydney playing his first game since 2012. 5 knee reconstructions since his last game. Bloody outstanding effort to get back. He's in the wrong occupation. Retrain for another one. It was his good knee that went today. The one that he had all the surgery on is totally fine. * pity most of their supporters were half legless up at Mt Buller or Hotham. Lack of banter going on up here. So who is going to step up coming into the finals ? Harder to pick than a broken nose! ... will they actual end up selling any tickets? A few people are saying they're vulnerable. I don't think so. I reckon they'll flex their muscles tonight and remind the comp who the big boys are. I agree. Richmond look morals to me. The Demons and GWS can go a fair way into the finals, with West Coast and the Magpies having flaws that can be exploited. Tigers for me and the Demons the team from the bottom half who can challenge. They're just too good Voyager. Only a rare off day can stop them from going back to back. Looking forward to tonight's game. Hard one to pick. I rate Melbourne as the better team but they're a big unknown playing their first final in years. The pressure might just get to them. They have a massive advantage in the ruck which they need to capitalise on. Heart say Demons, mind say Cats. Go Dees. High expectations of this game, should be a cracker. Can’t see anyone beating the Tiges though. Back to their best last. Hawks won most statistical categories but were flogged on inside 50s and scoring shots. They just set up so well behind the ball, Richmond. Repeat entries and they just grind you down. The Dees have been playing well, but I didn't see that quarter coming!!! And here was I hoping for a shootout. Interesting game in a sense- that is, just how much you can butcher your opportunities. Now I’m no coach, but the advice to the Dees at three quarter time should be pretty straightforward- how about you blokes KICK A FCUKING GOAL!!!! Sensing a tight finish- when this game should be anything but. Three dud finals so far. Too much to expect a good one here? Again, they simply lack depth - they have been really shown up, unable to adequately fill some key positions - Naismith (ruck) Reid (tall forward) and Mills (back) - at the back end of the season. Missing two talls left them one dimensional against good sides, with Buddy the only target. I worry whenever Daniel Robinson gets a game - he can't play! Hannebery isn't a shadow of his old self, must be traded, same for Jack, past it. GWS were just far better than The Swans - both on paper and in execution. Although they have as good a roster as anyone, and are getting players back and available at the right time, I don't expect GWS to go much further - they lack the genuine character of some of the other teams who are playing well. Trust you WERE satisfied with last nights game. 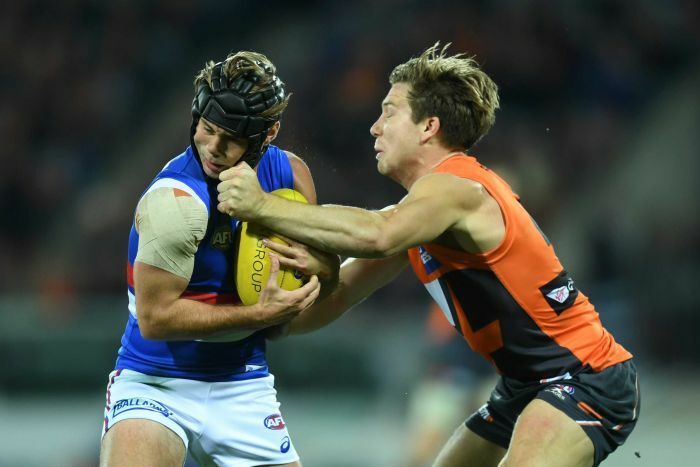 Serial grub, GWS's Toby Greene has been "Green Lighted" to continue kicking players when they are not in possession of the ball. That is a little bizarre? If the other coaches catch onto this, will we see some MMA during the finals? What the fcuk are they doing - make up a reason and rub this grub out for good! He surely has a long and distinguished career in the NRL awaiting him should he decide to switch codes. ... he would only be a minor grub by the NRL's lofty standards ... not sure what his Mad Monday game is like either! Copied that move from the Billy GOAT. Toby Greenes kicking, should be illegal to the game. the fans dont like it, simple. AFL is nothing without the players, but equally nothing without the fans. The fans boo that kick marking, end of story. In my opinion, it should simply be ruled as Kicking in Danger. A rule that already exists. You cant throw your foot aggressively at a player, its deemed as kicking in danger. why people arent mentioning that rule, baffles me. When a player hunts down a ball on the ground, and a foot goes flying at him: kicking in danger. The fact the ball is in the air, near a players head, innocently going for a mark, and a foot flies towards his head or body in general: kicking in danger. ...other than kick boxing and MMA, what reputable sport allows this gelati? There are many ways to deal with this under existing rule - bringing the game into disrepute comes to mind. Don’t often agree but certainly have to here. Greene is a thug, his king hit on Caleb Daniel proved that and his thinking despite reported help has not improved. I agree with you Softy. Sometimes you long for the old days when a smug little sniper like Greene might have had some retribution summarily dealt to him by a Dermie, Dipper or Rhys. Now the pr!ck thinks he’s found a way of potentially harming others consequence free. And he has! Gotta love his highlight reel ... reminds one of a Serena Williams type of victim gelati person.